You tell us to be here-now, without goals and without purpose, but then you allure us also by talking about ecstasy, enlightenment, freedom and the possible fulfillment. It looks contradictory. Please explain. It is not contradictory at all; it is a simple fact. But the mind tends to create problems where they don’t exist. Mind is a problem-creating mechanism. When I say that ecstasy is beautiful, when I say that enlightenment is blissful, I’m not talking about the future, I’m not alluring you – I’m simply stating a fact. When I say be here-now without any purpose and goal, I’m showing you the way how enlightenment can happen right now. Enlightenment is not a distant goal. It is a present possibility. You can miss it. That doesn’t mean that it is far away from you; that simply means that you are fast asleep. You can miss it. That doesn’t mean that you have to work hard to attain it; it simply means that you are not aware of something which is already surrounding you. I will go on talking about enlightenment, because without it you are not alive at all; without it you only seem to exist but you don’t exist; without it you go on missing. But remember, I am not creating a goal for your desires. Enlightenment can never be a goal. This has to be understood. Nirvana cannot be desired. Let me explain it to you. Whenever you desire something, you become tense. The desire creates disturbance. Whenever you desire something, of course, you desire in the future. In the present, how can you desire? There is not enough space for a desire to exist in the present. It can only exist in the future. Desiring can only be concerned with something in the future, with something which is not here. That which is here cannot be desired. You can delight in it, but you cannot desire it. You can live it, you can dance it, but you cannot desire it. We turn everything into a goal. Put anything into the mind; it immediately reduces it into a goal and the problem arises immediately. Then the mind asks ‘how?’ – how to achieve this, how to get it, how to become it. Again you are on the track; again you have missed. When you can see the total futility of desire, will you ask how to drop it? If you see the total futility of it, it drops by itself. You go on asking how, because you still want to cling. You still want to postpone it. You still think there must be something in it. ‘Maybe I am missing, maybe I am not making right efforts, maybe I am not moving in the right direction – but there is something.’ You are still hoping. When you look into the nature of desire, you will understand that it is like a horizon. It appears far away, there. Go, move – it moves with you. When you reach the point where you were thinking that the earth meets the sky, it is not meeting there. Again, at the same far distance, the horizon exists. Again move – the horizon moves with you. The distance between you and the horizon remains constantly the same. If you look into desire, it is so simple to see. If you meditate on desire, this is a fact; this is not a theory about desire. You have ten thousand rupees. The mind asks for twenty thousand rupees. The mind says, ‘Unless you have twenty thousand rupees, how can you live happily? It is impossible.’ You can get twenty thousand rupees. You will waste a long time for it; one day you will get it. By the time you have got twenty thousand rupees, the desire has gone further away. Now it asks for forty thousand rupees. By the time you attain to twenty thousand rupees, you have become more addicted to comforts; now more comforts are needed. Now the old house looks small, the old car looks an insult; it has to be dropped. A new car is needed. By the time you reach the forty thousand line, the horizon has gone further away – it demands eighty thousand. It goes on doubling. The distance remains the same. Between the desire and the fulfillment, the distance remains the same. It never changes, not even for a single inch. The beggar and the emperor are always in the same plight. If you look at the distance between their desire and fulfillment, you will see they are sailing in the same boat. Once understood, desire drops by itself, on its own accord. Not that you drop it, so the question of how never arises. And when desire drops, there is desirelessness. Not that you have to make efforts for it to be there; not that you have to work hard to gain desirelessness. It is not a goal. When desires disappear…. The absence of desire is desirelessness. Let me say it in another way. Ordinarily whenever the word ‘desirelessness’ is used, you think it is against desire. It is not. Desirelessness is not the opposite of desire. Desirelessness is simply the absence of desire, not the opposite. If it is the opposite then it can become the goal. It is not the opposite. You cannot make a goal out of it. Love is not opposite to hate. If love is opposite to hate, in that love, hate will go on continuing, an undercurrent of hatred will go on flowing. The authentic love is not opposite to hate. The love of a buddha is not opposite to hate. It is simply absence of hate. Compassion is not against anger. When anger disappears, compassion is. Compassion is not to be fought for; it is not against passion. When passion disappears, compassion is. Compassion is your nature. Desirelessness is you. When all desires have gone and you are left alone, in that beautiful aloneness, pure aloneness, crystal-clear aloneness, there is desirelessness. Not even a trace of desire… no goal, nowhere to go. Then for the first time you live what life is, for the first time your song bursts, spreads all over the existence. For the first time you become capable of celebrating. This is called enlightenment, nirvana. Nirvana can never be a goal. When you don’t have any goal, nirvana comes to you. You never go towards nirvana. When you are not going anywhere, it comes to you. Or, if you want to use the language of bhaktas and devotees, you can use the word ‘god’. You are not to go towards god. One can never go towards god. Where will you go? Either he is nowhere or he is everywhere. Where will you go? You cannot make an object of god. You cannot make an arrow of your desire moving towards the target of god. Either god is everywhere – so you cannot make a target; or he is nowhere – then too you cannot make a target. Nobody has ever reached to god. When you stop all reaching, when you drop the whole nonsense of achievement, suddenly god comes to you. And when he comes, he comes from everywhere, from all directions. He simply enters in you from every pore of your being. You never reach to him; he always comes to you. A searching mind is a tense mind. A seeking mind is not at rest. A desiring mind is not at home… always wandering, wandering, going somewhere. If I come to you, do you think I will find you there? You may be somewhere else. You are always somewhere else. Wherever you seem to be, you are not there. If you are sitting in the temple, your appearance only is in the temple. You may be in the market. You may be in the shop or in the factory or in the office. When you are sitting in your office or in your shop, only your appearance is there – you appear to be there. Your mind may be anywhere; the world is vast. You are never where you are. Just be there. Wherever you are, be there. This is the door to the divine and the divine enters in you. 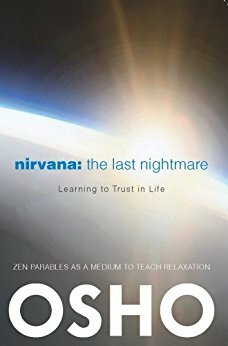 Nirvana becomes a nightmare if you seek it. And then the nirvana is the greatest nightmare there is. Wealth can be found if you seek it. Power, prestige, can be found if you seek it. Of course, it takes a long time, much effort, and is almost useless, because when you have found it you find nothing there. But you can find it. If you are mad enough you can find anything in the world. You just have to be mad enough… almost insane, crazy. Then you will win, because nobody will be able to compete with you – unless somebody crazier than you comes to compete with you. You can find anything in the world that you crave for. There will be a nightmare, but there is an end to it. But nirvana is the last and the ultimate nightmare. Once you start seeking it, it is never going to happen – because the very nature of it is such that the very nature prevents you from reaching it. So when I say be here-now, I am saying please help nirvana to come to you. Be at home. Just wait. Sooner or later you will see – god has knocked. He has been continuously, constantly knocking, but you are not there to hear, to listen. You are not there to open the door. The guest is always standing-at the door, but the host is missing. Be a host. That’s what I mean when I say be here – now. This simply means be a host to life, be a host to existence. Remain available. And everything is going to happen to you. Nothing is going to be debarred. There is nobody hindering the path except your own desire, except your own continuous running here and there. Rest a little while. And when I say rest, I mean rest here-now. Don’t postpone it – because who can rest tomorrow? And I will go on singing the beauties of ecstasy, but don’t misunderstand me. I’m not trying to convince you that nirvana has to be achieved. It is not a goal. It cannot be made a goal. It cannot be made an object of desire. It is available. Just look. Have an alert look. Life is tremendously beautiful. It is showering on you from everywhere. This I call meditation. This is what zen calls zazen – just sit, in an infinite waiting… watching, alert, aware, not going anywhere… and the miracle of miracles happens – that which you were seeking and could not find, suddenly happens. There is no contradiction in it, but your mind will make a contradiction, because unless your mind makes a contradiction out of it then the mind has no function to fulfill. First it creates a problem, then it tries to find a solution. Don’t allow the mind to create a problem where none exists. The mind goes on creating problems and then it goes on supplying solutions. Have you not watched this nonsense? Cut the mind from the very root. Don’t allow it to create a problem – that is the solution. Otherwise the mind will give you a solution. In the first place the problem was false. How can the solution be right? If you solve a false problem, the solution is going to be false. Then you are caught in an infinite regress. Then in the solution the mind will again find problems. Then again solutions have to be supplied. And then you go on and on. If your own mind cannot give you a solution, you go to greater minds; they can supply solutions. You go to philosophers – people who have theories, doctrines, scriptures in their heads. If you cannot supply your solution then you look at the experts; then they supply you with a solution. But experts have not helped anybody yet. Fifty centuries’ history of philosophy has not even given a single solution to any problem. On the contrary, it has created more and more problems. Whenever the mind is trying to create a problem, first try to find out whether the mind is playing the old trick again. Because as I see, life is absolutely simple. It has no problems. I don’t mean that life is not a mystery. I mean that life is not a riddle. You cannot solve it. Life is a tremendous mystery – but very simple. You cannot solve it. You can live it, you can enjoy it, you can merge into it… and doors upon doors open and it is an endless journey of revelations; greater and greater revelations are waiting for you… but it is not a riddle which can be solved. The more you enter in it, the more unknowable it becomes. The more you know, the more you know that you don’t know. One moment comes when all knowledge seems futile. That is the moment where a consciousness goes through a conversion – from philosophy to religion; from futile, stale theories to a fresh and eternally alive source of life. Life is a mystery; it cannot be solved. It has no solution. It has no answer. Don’t try to solve it. That is what the mind is constantly doing – trying to solve. Cut the root. Whenever the mind tries to bring a problem, first try to see – is there a problem really? It is such a simple thing that I have said. Be here-now – and enlightenment happens to you. It has already happened; only you have to recognize it. It has happened even before you were born. It has happened simultaneously with your life. Your very existence is enlightened. Just a turning-in, a conversion… and the recognition. And the recognition is possible only if you turn here-now. If you go on moving, chasing the shadows, then you will not have time and space to move within. All future is without, and the present is within. The present is not part of time. The present is eternity. It is now – eternal. It is within you. Once you turn in, you will start laughing. It is said that when Bodhidharma attained, he started laughing, a deep belly-laughter. He started rolling on the ground and the disciples gathered and they said, ‘What has happened? Have you gone mad?’ He looked really crazy. He was sitting for nine years and nobody had ever seen even a smile on his face. He was a very severe and serious person. For nine years continuously he was looking at the wall… continuously sitting near the wall and looking at the wall. He had not even turned to talk to any man for nine years – a very serious man. And he had decided that he would not get up unless he came to know what truth is. Tradition has it that his legs withered away. Nine years is a long time; maybe it really happened. But that is not the point. One thing is certain. Legs are representative of activity, movement, desire, going, a goal. Legs are representative of all that. Certainly in those nine years, goals disappeared. There was nowhere to go. All motivation, all desire to achieve disappeared. Certainly legs withered away. And then one day suddenly this man is rolling and laughing – must have gone mad. People must have been thinking that sitting for nine years watching the wall is bound to create madness. But why was he laughing? He was laughing at the whole absurdity, the very ridiculousness of it – that all that he was seeking he had already within him and he was not aware. Your treasure is with you. Your treasure is already within you. I can see it but you cannot see it. Being with me is just an opportunity so that you can also see that which I can already see in you. When you come to me, you are precisely valuable to me. When you come to me, I see a buddha coming. I would like to bow down and touch your feet… but that can be dangerous for you, so I resist the temptation. You are already mad – you will go even more mad. But that’s what I would like to do…. You are already there where you would like and wish to be. You are fulfilled. I can see your flower has bloomed, it has always been blooming there, but your eyes are wandering somewhere else. So when I talk about enlightenment, I am simply stating a fact about your being. I am not giving you a goal to be desired. And then immediately I have to tell you to be here-now, because that is the way you will be able to see the blossoming of your being. There is no contradiction. If it appears to you, look again. Your mind has deceived you. Cut the mind from the very root.